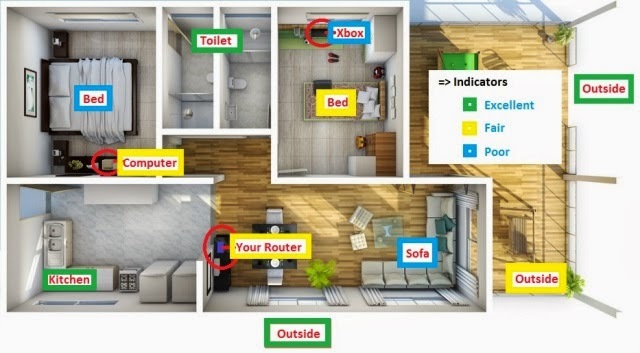 If you are getting low signal in your wireless devices such as laptop mobile you can extend the wifi signal of your router using Range Extender or Wifi Repeater. In this page I recommend you to use Cisco Linksys RE1000 Wireless-N Extender. a) Connect the RE1000 to any power source (later you can move this device to the places where wifi signal is very low) and turn it ON. a) Disconnect your laptop from other wire or wireless connection if exists. c) Type admin as username and admin as password for the Login. d) Go to Wireless, then select Basic Wireless setting located in the sub menu. f) Provide the same password of your router in the passphrase field. h) Disconnect wire from the laptop and RE1000. Finally check the signal of your wifi showing in the laptop. Is it full ? I do not have a router and i can only get a weak, slow signal on my ipod touch from a corner in my room. I am using my neighbors wifi and they suggested i got an linksys extender setup that i could put in my room where i get the signal and then it would magnify the signal. Any suggestion?